If you thought paella would be a time-stretch for a weeknight meal, think again. This pared-down version with chicken and sausage comes to the table in about 35 minutes. 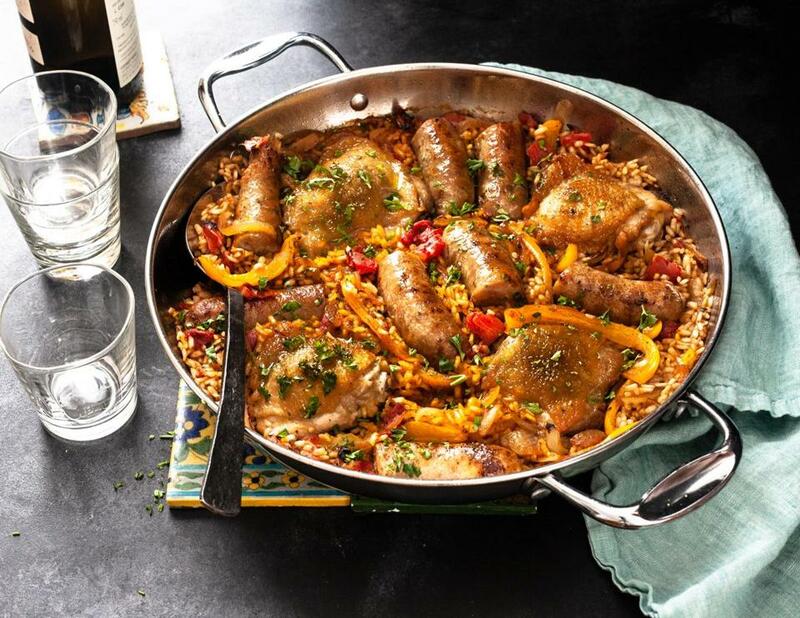 Brown chicken thighs and sausages in a skillet with a heatproof handle or in a shallow flameproof casserole, then soften a base of bell peppers and onions. Add rice to the pan, fire-roasted canned tomatoes, chicken stock, and saffron, and pop it in the oven. Now wait about 15 minutes for dinner to be ready. Paella was invented outdoors over an open fire, so cooking it on the stovetop can be tricky because the burner heat under a large pan is usually uneven. Transferring the pan to the oven will cook the rice evenly. To make the famous crusty golden bottom layer of rice (called socarrat), take the pan from the oven when the rice is cooked and set it over a burner for a few minutes. The ideal rice is short-grain, which absorbs liquid well while maintaining a degree of firmness. Spanish Bomba rice is traditional (and hard to find); a readily available substitute is Italian Arborio rice. When cooked, the rice has a pleasing, chewy quality. Serve the paella in the pan, like Spaniards do, placed in the center of the table for guests to help themselves. 1. Set the oven at 375 degrees. 2. Sprinkle the chicken all over with salt and black pepper. In a 12-inch skillet with a heatproof handle or a shallow flameproof casserole over medium-high heat, heat the oil. Add the chicken and sausages and cook for 4 minutes on a side, or until browned. Transfer to a plate. Cut large sausages in half. 3. Pour off all but a thin layer of fat from the pan. Lower the heat to medium. Add the onion, bell pepper, and garlic. Cook, stirring, for 8 minutes, or until softened. 4. Turn the heat to medium and stir in the rice. Cook, stirring, for 2 minutes, or until it is translucent. Stir in the tomatoes, stock, saffron with its liquid, salt, and black pepper. Bring to a boil. Arrange the chicken, skin side up, and the sausages on the rice mixture. Cover the pan and transfer to the oven. 5. Cook for 15 to 18 minutes, or until the rice is just tender and the liquid is absorbed, and the chicken and sausages are cooked through. 6. For the crusty layer of rice on the bottom, set the pan on a burner over medium heat for 2 to 3 minutes, turning the pan often so it cooks all over. 7. Sprinkle with parsley and serve in the pan (if the handle is hot, wrap it with a clean kitchen towel).